Liberals think this way because they are basically physical cowards. Unlike the fearless keyboard warriors of the internet right. Isn’t the right always claiming that the leftist protesters are the violent ones? Thank you…I knew she was appointed…I knew he was found guilty…and I know that despite all that, she was being held responsible. she should be aware of everything everyone else thought Palin should know. however people would be fired for showing what’s really what. If it’s a pattern, show the pattern. Otherwise you are making a mountain out of a mole hill. So you are saying a first term, back bench Representative requires the same, or even more, scrutiny that the person who is first in line to succeed the President. You might want to think that one through again. are you seriously arguing that she can be less informed about govmnt, laws etc because she is not running for VP? remember she is one of the key lawmakers in govmnt. note - try not to use tripping nincompoops like maxine waters or wasserman schultz as a gauge. And Palin WOULD HAVE been on heartbeat away from the presidency. So yeah, making sure the president picked a qualified candidate to fill those shoes is pretty pertinent. Sounds a lot like what we commonly referred to as “sophomoritis” except she’s a freshman. No one is compelled to do what she wants. She’s only getting as much coverage as the right-wing media seems to be giving her. I seem to hear more from my right-wing friends and family about her than I do from my left-wing friends and family. The right-wingers can’t stop talking about her. AOC-DS is the diagnosis. yes, we know-don’t like it, dismiss it as noise. I’m so sorry the truth hrts. If only people had the courage to call out the president with such vigor. You say that like you think being a revolutionary is a bad thing. Preposterous! Back bench? Nobody puts Sandy on the back bench! All your old white people are boring. You keep shifting your argument to give you more excuses to insult people you disagree with. There are two issues here. The one on the table is the complain the AOC received less scrutiny than Palin and yes, I believe a person a heartbeat away from the Presidency will be scrutinized ore closely than a first term Congressperson. As to whether any of the people you mention could pass High School civics, this thread has demonstrated repeatedly that most of the “flaws” of AOC were invented by her opponents, not derived from her actions. You can insist otherwise, all you imperil by doing so is the truth. But then we’re back to my observation that modern conservatives reduce everything to a matter of who can pile up insults the fastest I would prefer government not be viewed as Middle School, but maybe that’s just me. 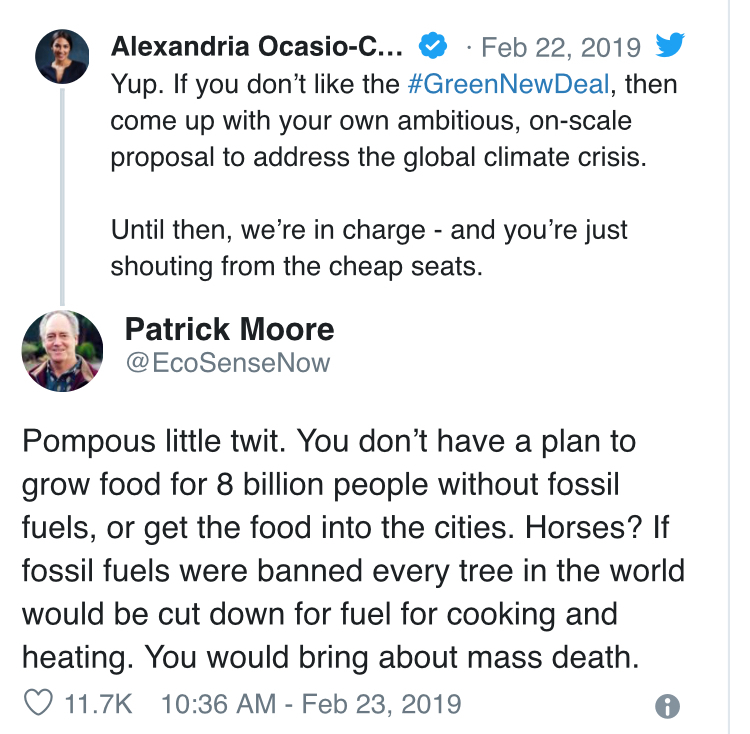 He would have a point if anybody wanted to ban fossil fuels with no replacement. Do you know what the word “transition” means? but to her, 10 years is along time.